The L37A1 is a British 7.62mm General Purpose Machine Gun (GPMG), it is an Enfield L7 GPMG with modifications to make it suitable for use as as a turret mounted machine gun on Armoured Fighting Vehicles (AFVs), in game it is found as the turret mounted machine gun for some British Rank 6 tanks. The Enfield L7 GPMG of which the L8A1, L8A2, L37A1 and L37A2 are all variants, is itself a British licence-built version of the Belgian FN MAG GPMG. As such the L37A1 performs identically to the L37A2 and almost identically (having a slightly higher rate of fire) to the FN MAG, L8A1 and L8A2. Being only a 7.62mm machine gun it is largely ineffective against all but the most weakly armoured, or open cabin, vehicles. The L37A1 performs identically to the L37A2 and has a slightly higher rate of fire than the FN MAG, L8A1 and L8A2. Like the the L8A1 and L8A2, the L37A1 can only be equipped with one ammo belt consisting of two Armour Piercing (AP) bullets, followed by one Tracer (T) bullet. Neither bullet has much penetration (maximum of 10mm), however the AP bullet performs much better than the tracer bullet. The L37A1 performs identically to the L37A2, while having a slightly higher rate of fire than the L8A1, L8A2 and FN MAG. It has the same ballistic performance as the L3A1 found on previous British Vehicles, but has a higher rate of fire. Due to the very low penetration this weapon it is largely ineffective against enemy armour (although you may be able to penetrate some vehicles with extremely thing armour). 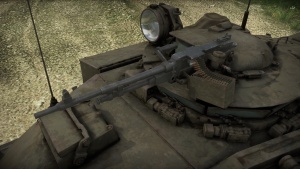 The gun is primarily useful for killing exposed crew members in open topped vehicles (although there are few such vehicles at the battle ratings this gun is found at). The gun can also be used for marking enemy vehicles and obscuring the view of enemy players (shooting at their gun sight). You can use the gun against aircraft however it does minimal damage. Better rate of fire than L3A1 machine gun. Better rate of fire than L381 and L382 machine guns. Better rate of fire than FN MAG machine gun. Along with the L8A1, L8A2 and L37A2 the L37A1 is a British License built variant of the Belgian FN MAG GPMG. The FN MAG is a Belgian 7.62 mm general-purpose machine gun, it was designed in the early 1950s by Ernest Vervier, while working at the weapons company Fabrique Nationale (FN). Between 1956 and 1957 the British armed forces trialled the FN MAG against the american M60, and selected the FN MAG. The MAG was built under license as the L7 GPMG by Enfield in Britain, with minor modifications being made. It entered service under the Designation L7A1 in 1963. The L37A1 variant was designed for use on pintle mounts near the commanders position on top of tank turrets and other AFVs. Like the L8A1 it has the shoulder stock removed, but maintains the original barrel (without fume extractor) and has a modified trigger. The weapon is designed so that infantry can dismount it and use it for self defence if necessary. This page was last edited on 18 March 2019, at 20:41.